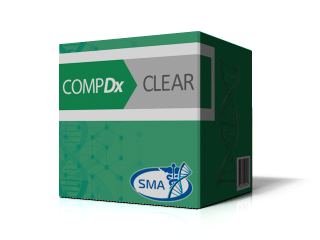 ComprehensiveDx ClearTM is a comprehensive panel for hereditary breast, ovarian, uterine, colorectal, pancreatic, prostate and melanoma cancers. Some types of cancer have a significant hereditary component and can develop due to a mutation in one of the hereditary cancer predisposition genes. Breast, ovarian, colorectal, endometrial, melanoma, pancreatic, gastric, and prostate cancers are among those with a significant hereditary component. A family history includes a number of cancer cases of several different types indicating a presence of several hereditary cancer syndromes. A family history is suggestive of inherited cancer; however the cancer type(s) do not seem to fit a particular hereditary cancer syndrome. Are you at high risk for Hereditary Cancer Syndromes? What are the possible benefits of genetic testing with ComprehensiveDx ClearTM? ComprehensiveDx ClearTM is a comprehensive panel for hereditary breast, ovarian, uterine, colorectal, pancreatic, prostate and melanoma cancers. This next-generation sequencing (NGS) assay analyses point mutations, gross deletions and duplications in the following genes associated with various inherited cancers: APC, ATM, BAP1, BARD1, BMPR1A, BRCA1, BRCA2, BRIP1, CDH1, CDK4, CDKN2A, CHEK2, DICER1, EPCAM (CNV only), FANCC, MLH1, MRE11A, MSH2, MSH6, MUTYH, NBN, PALB2, PMS2, POLD1, POLE, PTEN, RAD50, RAD51C, RAD51D, SDHA, SDHB, SDHC, SDHD, SMAD4, STK11 and TP53. This panel includes emerging genes (such as BARD1, CDK4, DICER1, POLD1) with limited data on their association with hereditary cancer in addition to well-studied cancer predisposing genes. The variants identified by the test are classified according to the guidelines for sequence variant interpretation of the American College of Medical Genetics and Genomics (ACMG). Variant classification categories include pathogenic, likely pathogenic, variant of unknown significance (VUS), likely benign, and benign with likely benign and benign variants excluded from the report. Cancer predisposing genes assessed by ComprehensiveDx ClearTM assay are associated with various hereditary cancer syndromes and increase the risk of cancer in many organs. BAP1 - This gene provides instructions for making a protein called ubiquitin carboxyl-terminal hydrolase BAP1 (shortened to BAP1). This protein functions as a deubiquitinase, which means it removes a molecule called ubiquitin from certain proteins. The presence of ubiquitin molecules on a protein can affect the activity of the protein and its interactions with other proteins. The ubiquitin "tag" also promotes breakdown (degradation) of a protein. By removing ubiquitin, BAP1 helps regulate the function of many proteins involved in diverse cellular processes. The BAP1 protein is thought to help control cell growth and division (proliferation) and cell death. Studies suggest that it is involved in the progression of cells through the step-by-step process they take to replicate themselves (called the cell cycle) and that it plays roles in repairing damaged DNA and controlling the activity of genes. BARD1 - This gene encodes a protein which interacts with the N-terminal region of BRCA1. In addition to its ability to bind BRCA1 in vivo and in vitro, it shares homology with the 2 most conserved regions of BRCA1: the N-terminal RING motif and the C-terminal BRCT domain. The RING motif is a cysteine-rich sequence found in a variety of proteins that regulate cell growth, including the products of tumor suppressor genes and dominant protooncogenes. This protein also contains 3 tandem ankyrin repeats. The BARD1/BRCA1 interaction is disrupted by tumorigenic amino acid substitutions in BRCA1, implying that the formation of a stable complex between these proteins may be an essential aspect of BRCA1 tumor suppression. This protein may be the target of oncogenic mutations in breast or ovarian cancer. Multiple alternatively spliced transcript variants encoding different isoforms have been found for this gene. CDK4 - gene provides instructions for making several proteins. The most well-studied are the p16(INK4a) and the p14(ARF) proteins. Both function as tumor suppressors, which means they keep cells from growing and dividing too rapidly or in an uncontrolled way. The p16(INK4a) protein attaches (binds) to two other proteins called CDK4 and CDK6. These proteins help regulate the cell cycle, which is the cell's way of replicating itself in an organized, step-by-step fashion. CDK4 and CDK6 normally stimulate the cell to continue through the cycle and divide. However, binding of p16(INK4a) blocks CDK4's or CDK6's ability to stimulate cell cycle progression. In this way, p16(INK4a) controls cell growth and division. The p14(ARF) protein protects a different protein called p53 from being broken down. The p53 protein is an important tumor suppressor that is essential for regulating cell division and self-destruction (apoptosis). By protecting p53, p14(ARF) also helps prevent tumor formation. CDKN2A - The protein encoded by this gene is a member of the Ser/Thr protein kinase family. This protein is highly similar to the gene products of S. cerevisiae cdc28 and S. pombe cdc2. It is a catalytic subunit of the protein kinase complex that is important for cell cycle G1 phase progression. The activity of this kinase is restricted to the G1-S phase, which is controlled by the regulatory subunits D-type cyclins and CDK inhibitor p16(INK4a). This kinase was shown to be responsible for the phosphorylation of retinoblastoma gene product (Rb). Mutations in this gene as well as in its related proteins including D-type cyclins, p16(INK4a) and Rb were all found to be associated with tumorigenesis of a variety of cancers. Multiple polyadenylation sites of this gene have been reported. DICER1 - This gene provides instructions for making a protein that plays a role in regulating the activity (expression) of other genes. The Dicer protein aids in the production of a molecule called microRNA (miRNA). MicroRNAs are short lengths of RNA, a chemical cousin of DNA. Dicer cuts (cleaves) precursor RNA molecules to produce miRNA. MicroRNAs control gene expression by blocking the process of protein production. In the first step of making a protein from a gene, another type of RNA called messenger RNA (mRNA) is formed and acts as the blueprint for protein production. MicroRNAs attach to specific mRNA molecules and stop the process by which protein is made. Sometimes, miRNAs break down the mRNA, which also blocks protein production. Through this role in regulating the expression of genes, Dicer is involved in many processes, including cell growth and division (proliferation) and the maturation of cells to take on specialized functions (differentiation). RAD50 - The protein encoded by this gene is highly similar to Saccharomyces cerevisiae Rad50, a protein involved in DNA double-strand break repair. This protein forms a complex with MRE11 and NBS1. The protein complex binds to DNA and displays numerous enzymatic activities that are required for nonhomologous joining of DNA ends. This protein, cooperating with its partners, is important for DNA double-strand break repair, cell cycle checkpoint activation, telomere maintenance, and meiotic recombination. Knockout studies of the mouse homolog suggest this gene is essential for cell growth and viability. Mutations in this gene are the cause of Nijmegen breakage syndrome-like disorder. SDHA - This gene provides instructions for making one of four parts (subunits) of the succinate dehydrogenase (SDH) enzyme. The SDH enzyme plays a critical role in mitochondria, which are structures inside cells that convert the energy from food into a form that cells can use. Within mitochondria, the SDH enzyme links two important pathways in energy conversion: the citric acid cycle (or Krebs cycle) and oxidative phosphorylation. As part of the citric acid cycle, the SDH enzyme converts a compound called succinate to another compound called fumarate. Negatively charged particles called electrons are released during this reaction. The SDHA protein is the active subunit of the enzyme that performs the conversion of succinate, and it also helps transfer electrons to the oxidative phosphorylation pathway. In oxidative phosphorylation, the electrons help create an electrical charge that provides energy for the production of adenosine triphosphate (ATP), the cell's main energy source. The SDHA gene is a tumor suppressor gene, which means it prevents cells from growing and dividing in an uncontrolled way. SDHB - This gene provides instructions for making one of four subunits of the succinate dehydrogenase (SDH) enzyme. The SDH enzyme plays a critical role in mitochondria, which are structures inside cells that convert the energy from food into a form that cells can use. SDHC - This gene provides instructions for making one of four subunits of the succinate dehydrogenase (SDH) enzyme. The SDH enzyme plays a critical role in mitochondria, which are structures inside cells that convert the energy from food into a form that cells can use. The SDHC protein helps anchor the SDH enzyme in the mitochondrial membrane. SDHD - This gene provides instructions for making one of four subunits of the succinate dehydrogenase (SDH) enzyme. The SDH enzyme plays a critical role in mitochondria, which are structures inside cells that convert the energy from food into a form that cells can use. The SDHD protein helps anchor the SDH enzyme in the mitochondrial membrane. Within mitochondria, the SDH enzyme links two important pathways in energy conversion: the citric acid cycle (or Krebs cycle) and oxidative phosphorylation. As part of the citric acid cycle, the SDH enzyme converts a compound called succinate to another compound called fumarate. Negatively charged particles called electrons are released during this reaction. The electrons are transferred through the SDH subunits, including the SDHD protein, to the oxidative phosphorylation pathway. In oxidative phosphorylation, the electrons create an electrical charge that provides energy for the production of adenosine triphosphate (ATP), the cell's main energy source. The SDHD gene is a tumor suppressor, which means it prevents cells from growing and dividing in an uncontrolled way.